We have just launched a complete redesign to the Daily in the Word website. 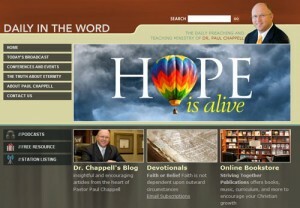 I’m thrilled with this newly designed, easy to navigate site, and I believe it will be a blessing to you. Since beginning the Daily in the Word radio ministry with one local station years ago, the Lord has blessed in incredible ways. Beginning today, October 1, the Daily in the Word radio broadcasts are being aired through CSN radio network. Daily in the Word can now be heard on 450 stations across America and around the world. (Visit the Daily in the Word website for a station list, or you can listen to the daily program via the internet or the free podcast.) I praise the Lord for expanding this ministry and making His truth more available in more places. Also included on the new website are the Daily in the Word devotions (which you can read online or subscribe to via email), information about Striving Together conferences and events, and links to all of our ministry podcasts. Please pray that many will come to Christ and that many Christians will be encouraged through the preaching of God’s Word.